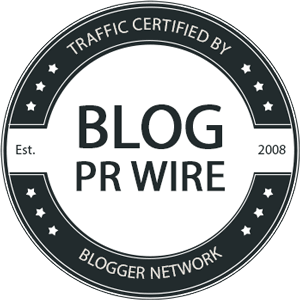 I enjoy my job as a marketing specialist, and more importantly, I like where I work. My company holds lots of fun holiday and social events and activities. One of the fun activities for Halloween this year was a scarecrow and pumpkin decorating contest. 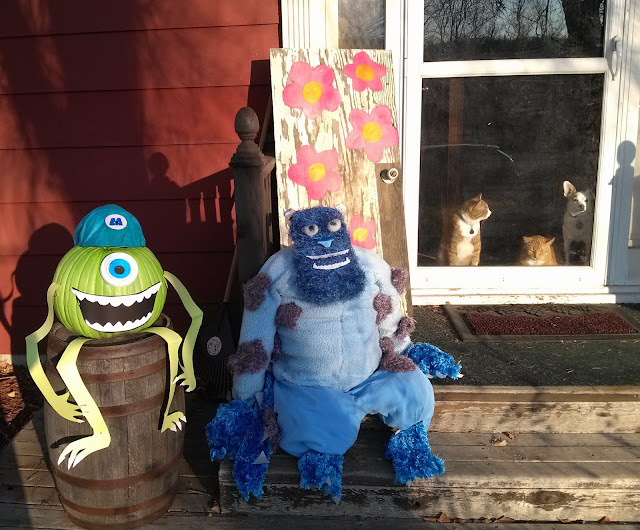 I teamed up with a couple co-workers to create our masterpieces - Sulley and Mike Wazowski from Monsters Inc.
We found most of our supplies at local thrift stores and around our houses. I think the only thing we bought new was the pumpkin for Mike Wazowski. 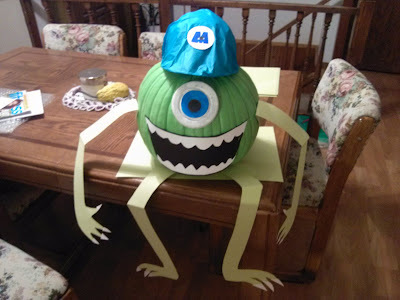 I painted it green, created limbs out of colored cardstock, and made accessories out of random items. 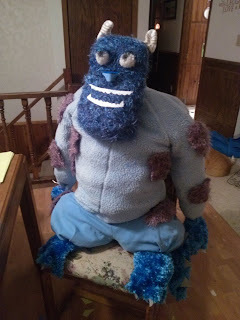 For the Sulley scarecrow, which was a little more complicated, we stuffed a fuzzy blue shirt and blue pants. But my pride and joy is the head, which I was in charge of. 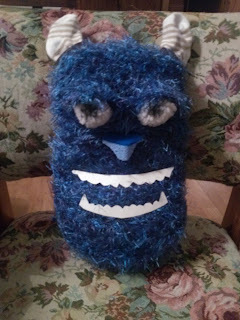 I used the inside of an old pillow and cut the foam into a head shape. Then I surrounded the foam with a blue fuzzy scarf that we had gotten at the thrift store. 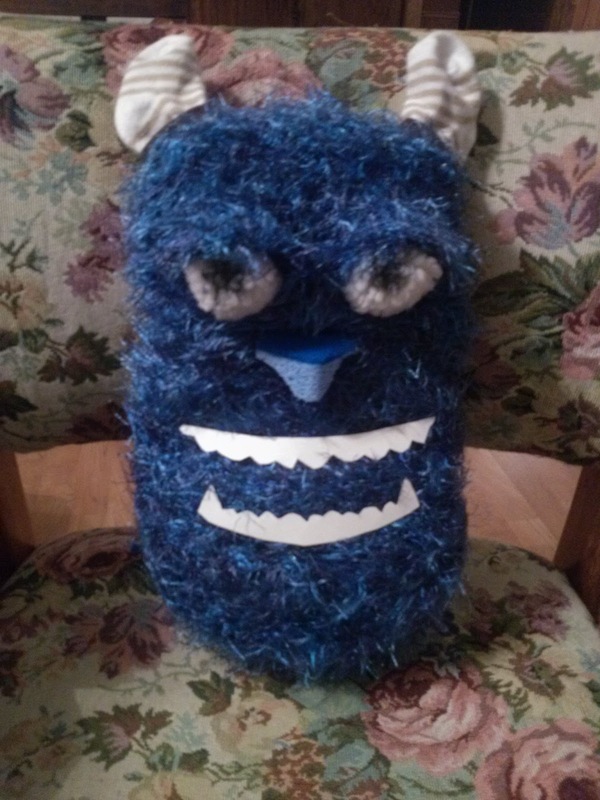 The eyes were balls of yarn that I cut off that old pillow and drew black pupils on with Sharpie. The mouth was cut out of white cardstock, and the nose was actually a blue kitchen sponge that I cut into a nose. My favorite part of all - the ears - which are actually baby socks that we got at the thrift store! It turned out so well! 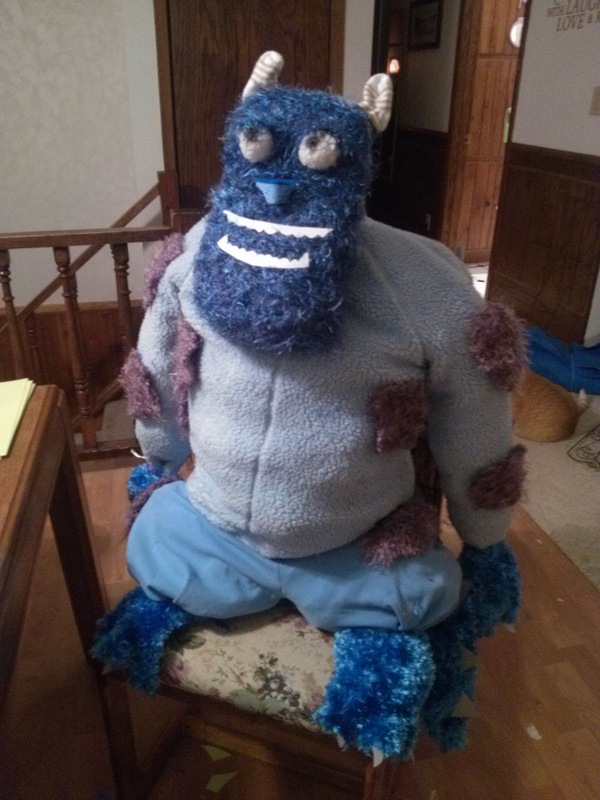 My co-worker created the hands and feet by covering stuffed rubber gloves with the fuzzy blue scarf material. And she added the purple spots to Sulley's body with a purple fuzzy scarf material. My dad found the piece of wood that we used for the door and attached the door knob, and I painted the pink flowers to make it look like Boo's door in the movie. 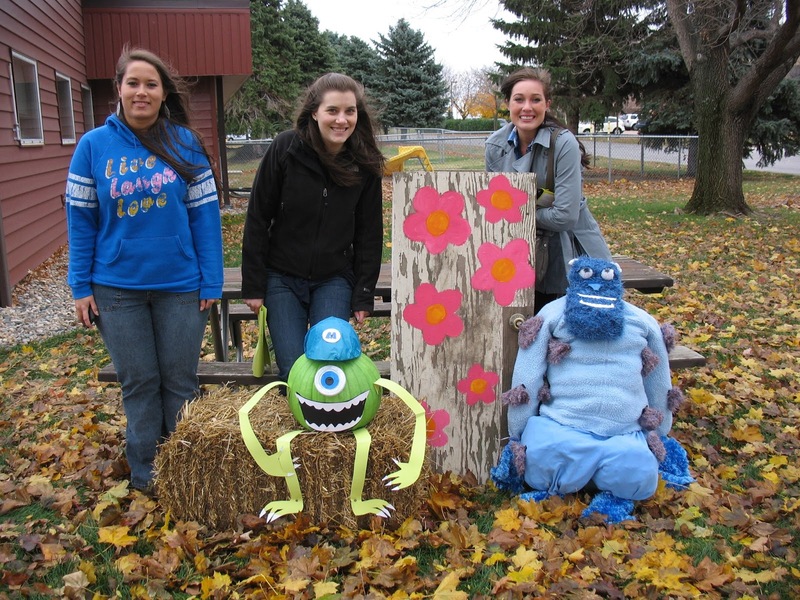 We had a lot of fun creating our Monsters Inc. scarecrow and pumpkin, and we won third place in both categories!